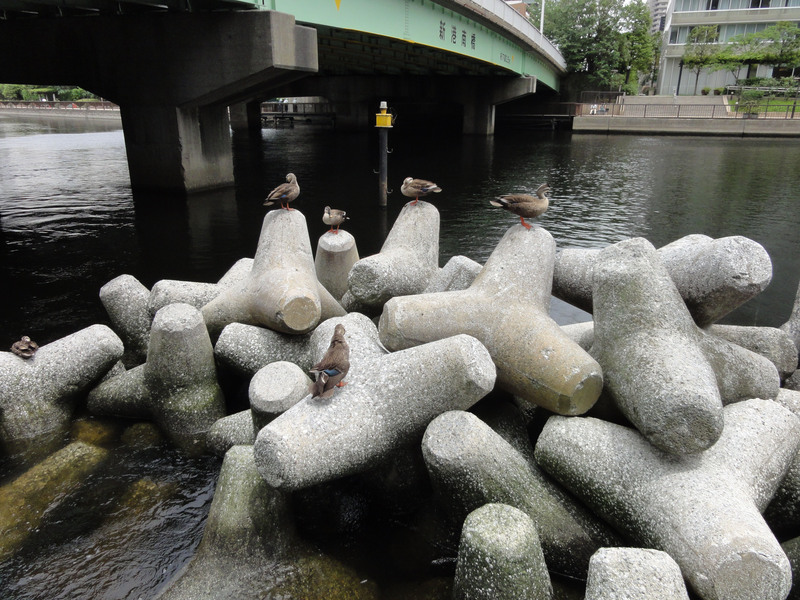 They make a great duck perch too: Tetrapods seen from the pedestrian walkway along the Takahama Canal in Minato Ward, Tokyo. I have always wondered about the curious cement structures you see up and down the coast of Japan, the ones that look like the toy jacks I played with as a child, except that they’re massive in size. I assume they are placed to protect the coast from weather and waves, but what are they called? Who makes them? And how the heck are they transported to the shore? Even more perplexing is that I recently I saw a pile of them inland, in a peaceful canal in Tokyo where I can’t imagine waves are an issue. So, why the heck are they there? Let’s start with the first part of your question. Those crazy jack-like structures are called tetrapods, from the Greek meaning “four-legged.” “Tetrapod” is actually a trade name registered to Fudo Tetra Corporation, a major supplier, but people tend to use the term generically. The proper generic nomenclature, for readers who like to know that kind of thing, is shōha block (wave-dissipation block) in Japanese and armor unit in English. Armor units are used all over the world — not just in Japan — to protect man-made constructions that get in the way of moving water, such as seawalls, breakwaters and land-reclamation projects like Kansai International Airport, which was built completely out in the water. Whether placed only on the open-sea side of a construction or all around it, armor units break the force of incoming waves and redirect the water so it doesn’t crash full-force against the construction. Tetrapods work particularly well as armor units because when arranged in lines or heaps, the legs lock together to create a stable, porous barrier that holds up well under even extreme conditions. To find out more, I paid a visit to Fudo Tetra’s Tokyo office, where public relations manager Takatoshi Matsubuchi explained that the tetrapod was invented in France in 1949. Up until then, coastal engineers typically used piles of stones or rubble to protect marine constructions, but the problem with that method is that loose pieces are easily scattered or washed away. The advantages of the tetrapod were obvious, particularly in Japan, which had 33,000 km of coast and more than 4,000 harbors and fishing ports to protect. In fact, Japanese engineers were so excited about the tetrapod that they didn’t wait for such niceties as contracts or licensing agreements. 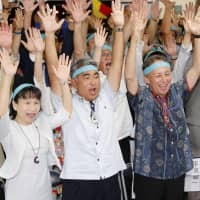 A patent dispute ensued and the Japanese government, eager to protect the country from kaigan shinshoku (coastal erosion), helped broker a swift settlement. In the following decades, and especially during Japan’s period of high economic growth, tetrapods and other concrete armor units were widely adopted. If you look up tetrapods online, you’ll see the widely repeated assertion that a full half of the coastline of Japan has been artificially altered with cement constructions. That’s a pretty shocking claim if true, but unfortunately none of the sites posting it provided a source. I did search for primary data but did not turn up statistics that could support or dispute it. But it’s safe to say that tetrapods are a common sight near the water in Japan and that supplying them is big business. You were right to wonder how tetrapods are transported. I looked up the specs, and even a small tetrapod weighs nearly half a ton, while the big boys can top 80 tons. This is obviously not the sort of product that can be shipped around the country. So what happens is that companies such as Fudo Tetra lease steel molds to local contractors which pour the concrete on-site where the tetrapods are to be used. Even the molds are huge — far too big to be transported intact on Japan’s narrow roads — so they are delivered in pieces and assembled before the pouring work begins. When the cement is dry, the molds are removed and the tetrapods are lifted into place with cranes. Matsubuchi couldn’t speak specifically about your inland tetrapods, so I set off to find out who manages the canal where you saw them. You couldn’t remember the exact location but the photograph you sent contained a critical clue: a bridge with visible writing. 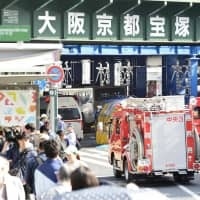 As loyal readers know (because this was the subject of a “What the Heck” in May 2011), all bridges in Japan have names. Using the bridge name, I was able to pinpoint the location to the Takahama Canal, which is managed by the Tokyo Metropolitan Government’s Bureau of Sewerage. A spokesman explained that treated water is released into the canal at regular periods. 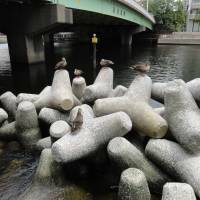 The tetrapods were placed near the release points to lessen the impact of waves on small boats. Tetrapods surfaced on television last year, making an appearance during the theme-song opening of NHK’s hit morning drama “Ama-chan.” The tetrapod shots were taken at the Kosode fishing port in Kuji, Iwate Prefecture, a location used throughout the show. When you consider that the theme-song footage aired six mornings a week from April until September, on a show that enjoyed over 20 percent national viewership, that’s the sort of exposure marketers would kill for. 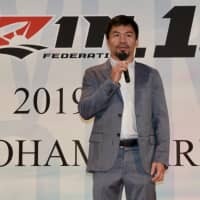 But Matsubuchi said it didn’t have a big impact on business. True, but there are a surprising number of people who think tetrapods are oddly beautiful, and other companies that can cater to their tastes. A company called Maniapparel, for example, makes T-shirts and sweatshirts with tetrapod designs, as well as grey felt stuffed-toy versions to strew around your sofa to bolster you from the shock waves of life. For more on this topic, including photos of tetrapods being made as well as information on where you can get tetrapod apparel and stuffed toys, visit my blog at alicegordenker.wordpress.com. Puzzled by something you’ve seen? 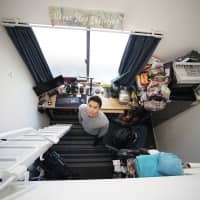 Tell me about it: whattheheckjt@yahoo.co.jp or Alice Gordenker, A&E Dept., The Japan Times, 4-5-4, Shibaura 4-chome, Minato-ku, Tokyo 108-8071.